Hello there! How are you? I hope well. All is good on this side of the World, schools are winding down for the big Summer holiday (Dec thru Jan) and as a teacher, I'm looking forward to lots and lots of stress-free, quiet and sun-filled days....sigh. Isn't she a beauty? A bit of a monster I have to say but a stunning monster! 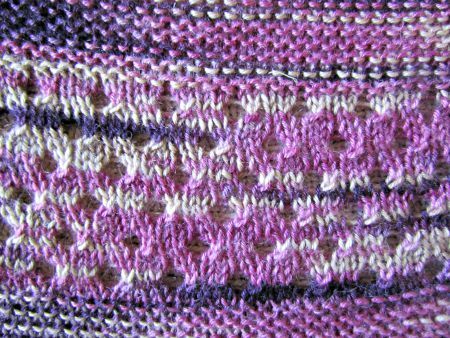 Really quick and easy to knit and the kind of pattern I enjoy because just as I'm getting tired of knitting one section, a different stitch begins and boredom disappears!!! Perfect. 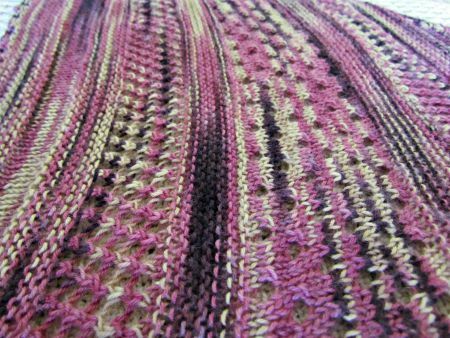 She's the Hiraeth pattern by Rae Gronmark which you can find here on Ravelry and I would really urge you to give it a go. 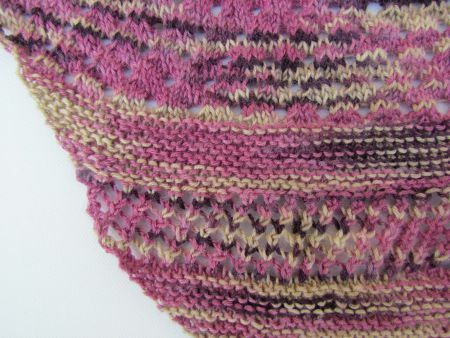 She's a real drapey scarf/shawl/wrap thingamajig (there must a word for that sort of garment - any ideas?) and I know my friend will get a lot of wear from it. I've stuck to the 3 colour option in the pattern but I think you could use more colours if you wanted to. The possibilities are endless!!!! Anyway, that's me for now. Thanks for popping in. 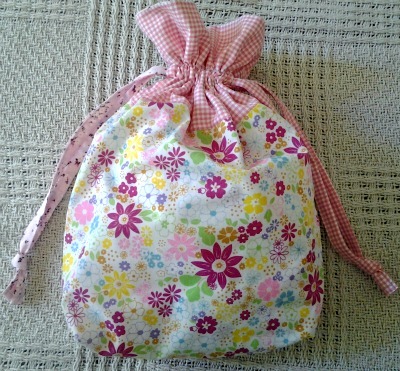 I had a few scraps of fabrics lying around so I thought Amelia (my sewing machine) and I would have a go at making some drawstring bags. What do you think? I'm quite pleased with how they turned out. I made a blue one first. It's small but perfect for a sock knitting project. 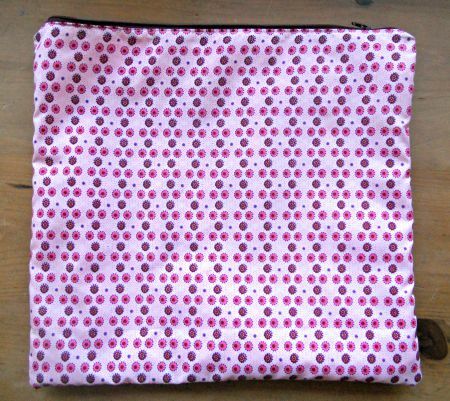 Then I made a pink one. This one is 2" bigger all round. I'm really pleased with them and I'll definitely be making more. If you'd like to give them a go, I used this tutorial from In Colour Order which was excellent. I haven't been here for the longest time. Sorry. Every time I thought of blogging I just couldn't find my mojo so it didn't get done. No stress. Been doing quite a lot tho. I made this. 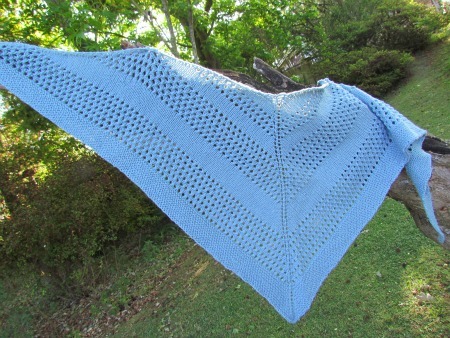 It's my first shawl design so I'm just ever such a bit proud! 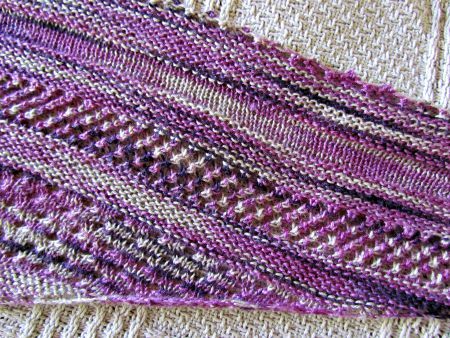 It's called The Rockey Street Shawl and I'm in the process of writing up the pattern which I'll make available as a freebie on Ravelry. 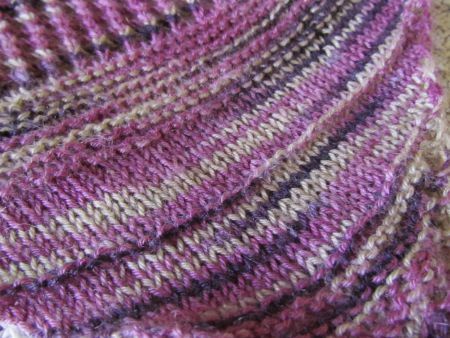 I may get a couple of test knits done beforehand so if you're interested in test knitting for me, please leave a comment and I'll contact you. It's really snuggly and warm and I can see myself making another one soon but bigger. More beautiful woolly warmness. Now I've had Amelia for 20 years. 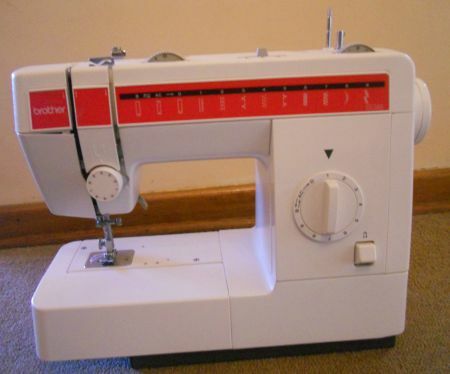 She was a gift from DH when we first got married and together, Amelia and I have made various soft furnishings including 4 full length fully lined curtains (been there, done that and never again)! 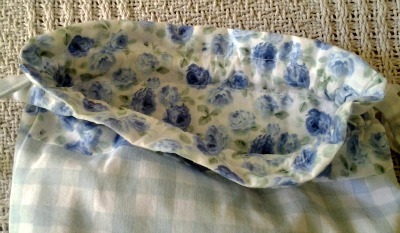 We have also made one or two very simple tops for me and the odd cushion cover for friends. However, Amelia and I have not always seen eye-to-eye. You see Amelia is very experienced. She has gadgets and gizmos and buttons and levers that do all manner of sensational things. I, on the other hand, am a novice sewer and Amelia knows this. Not only does she know it, but she takes great joy in reminding me of it ..... often. I'll be chugging away on a project when suddenly WHAM! Amelia decides to jam. 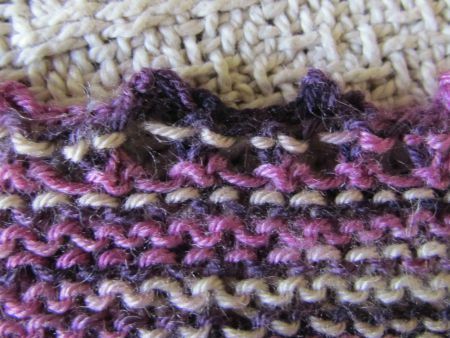 This is normally right in the middle of a seam or a zip or some other really tricky bit of sewing where I'm sitting on the edge of my seat, holding my breath and sweating like a marathon runner. But Amelia doesn't care. She jams and then makes it very very difficult for me to unjam her. Thread gets tangled, fingertips turn into marshmallows and projects end up being thrown across the room and then pushed roughly down into the depths of the dustbin. Today, I made this with Amelia's full co-operation. 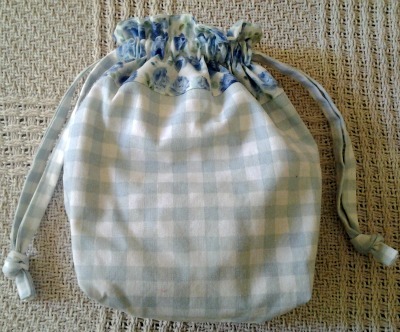 But it's no ordinary bag because it's the first thing I have ever sewn WITH A ZIP!!!! I have to admit that I've tried before but Amelia has always been in "one of her moods" and I've always been at my most nervous. But not this time. This time the zip went in first time, no mistakes, no problems, no jams and no swearing by me! A first in every department. I even lined it. Aren't you impressed? I am. So after all my years of fighting with Amelia, how did I manage to complete this project in not only 1 day but in 1 hour???? 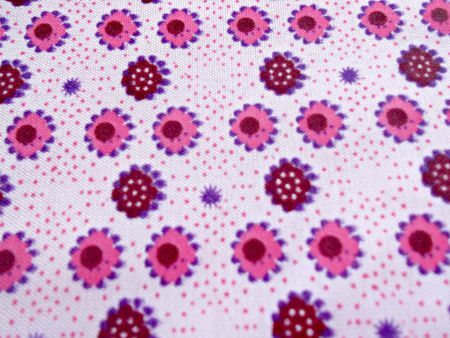 Well, it's all down to this rather lovely post on this rather lovely blog Melly Sews and I have to say, I couldn't have done it without her. Not only are there pictures (always good for a visual learner like Moi) but there is a video too!!!!!! How cool is that?? Perfect. 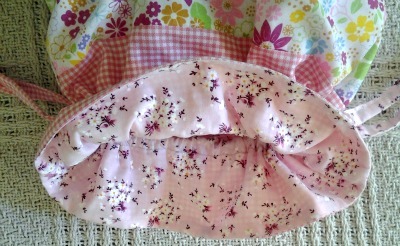 And here it is stuffed with one of my current projects A Log Cabin Blanket from a fab designer Staci Perry at Very Pink. 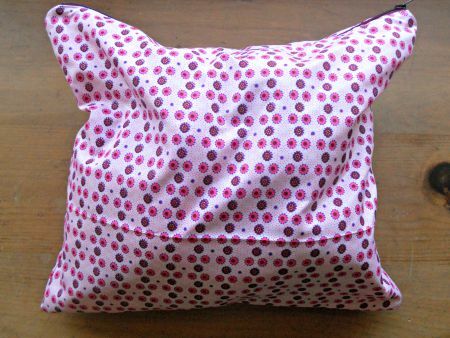 And if I do ever get bored using it as a bag then I could indeed use it as a cushion cover (stuffed with yarn, of course)! I'm off now to skip into my kitchen for a celebratory cup of coffee! 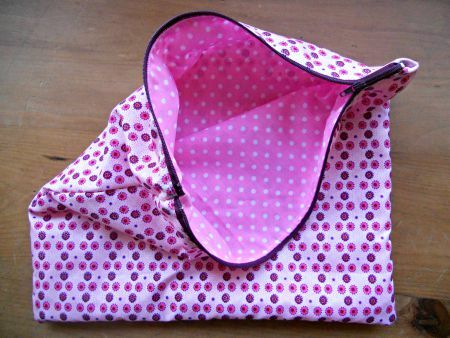 ps No sewing machines were harmed in the making of this bag! Hello... How are you? Thanks for stopping by. Well, it's turned into this. The pattern is Over The Sea To Skye and if you get the chance, please make it because it's easy, rhythmical and a pleasure to make. 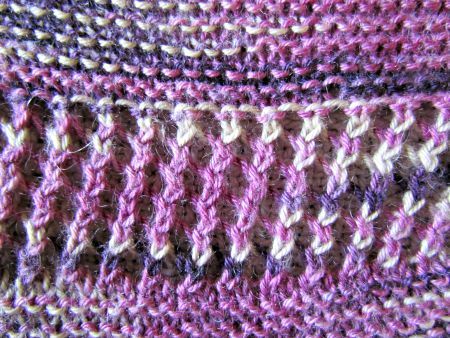 There are lots of lovely stitch changes to keep your brain happy but it's still great a great TV knit or something for one of those long car/train journeys. 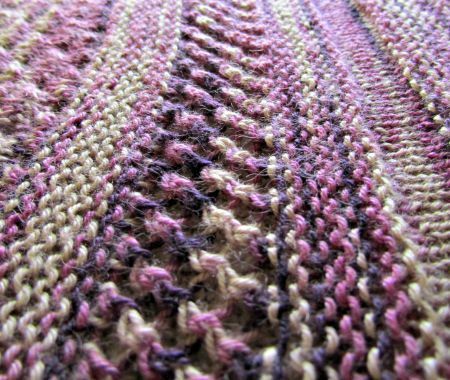 Here's my Ravelry link for my project if you're interested. In terms of the yarn it was spectacular! Everything I wanted and I'd been dreaming about knitting with this yarn for some considerable time so expectations were high. 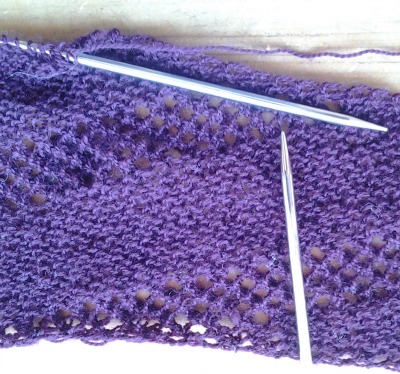 It worked up like a charm, didn't slip and slide on my needles and then blocked quickly and easily with no snagging on the pins. 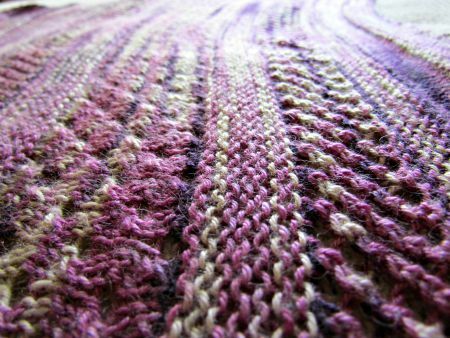 I've worn it twice since making it and it's as light as a feather and very very warm. I can imagine that socks in this yarn would be amazingly warm! My Over The Sea To Skye is coming along nicely..... I'm so enjoying this project. And so too is my Smithfield. 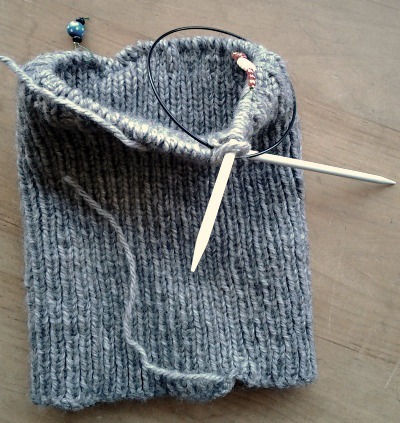 Aran yarn and big needles... what's not to love? 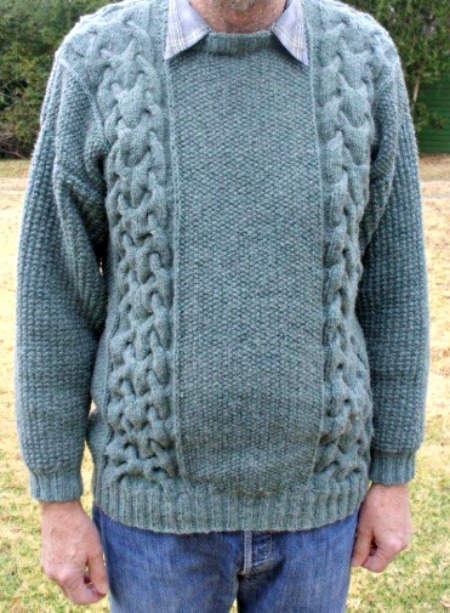 I finally finished the "redo" sweater that I was reknitting and it came out rather well. Want to see? 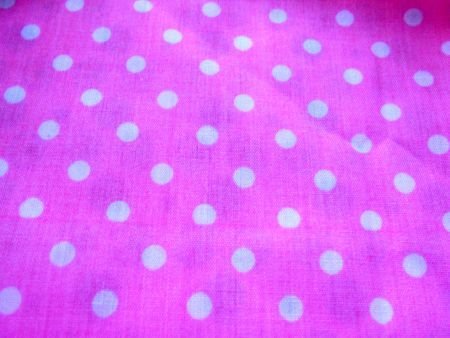 I was very happy with the result although it's a little short in the sleeves. 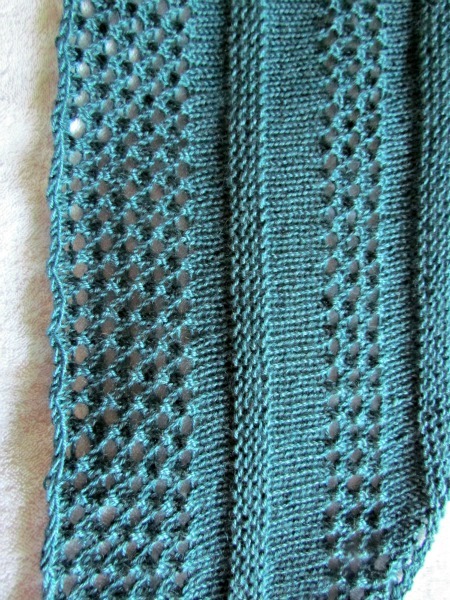 This will be remedied by picking up stitches around the cuffs and knitting another inch or so. The join won't show once its washed. I've done that a couple of times before and it works like a charm! Just LOVE that cable! 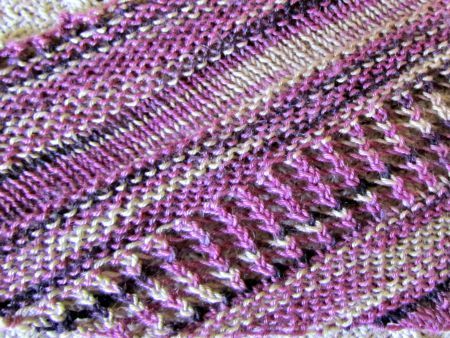 It's a new one that I've never tried before and whilst it was a bit fiddly to do in the beginning, I soon got the hang of it. 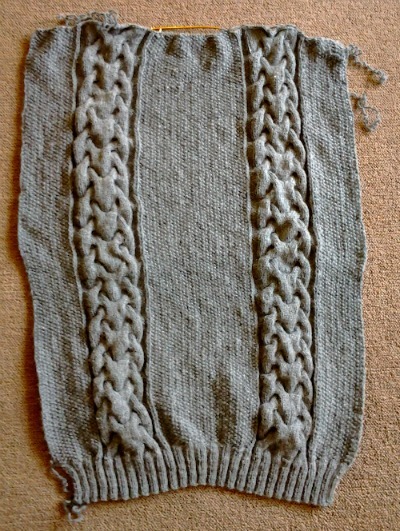 I love the contrast between the simple moss stitch panel down the centre and then that huge chunky cable! Gorgeous! What else, I hear you say? 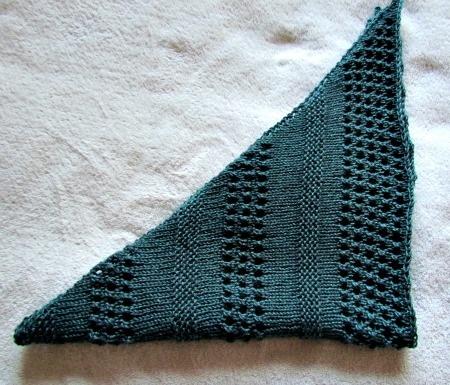 Well, I made a little shawl/scarf for a friend of mine. She loves pink so when I saw this yarn I knew it was perfect for her. The pattern is Linus and this is the second one I've made now. The first you can see here. Then I started a project which I am VERY excited about. Let me first give you a little bit of background so you understand the reason behind my enthusiasm. Here in South Africa there is very little choice when it comes to yarn. Almost all of the stuff you buy in the shops is 100% acrylic and whilst this is fine for most projects, sometimes I crave something a little more special. I see all the blogs of my UK and American friends where they show the most amazing yarns that they can get at their LYS but it's all just too expensive for me to even think about importing. A few local companies are cropping up now with some locally produced yarns for example Nurturing Fibres, African Expressions and Vinnis but we have nothing like the variety that my overseas friends have. All those yummy colours! 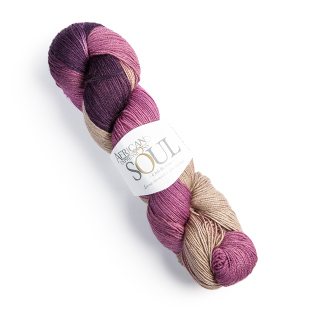 They do various other colourways but I know I'll never make socks with this yarn as it's just too gorgeous to be hidden inside shoes! 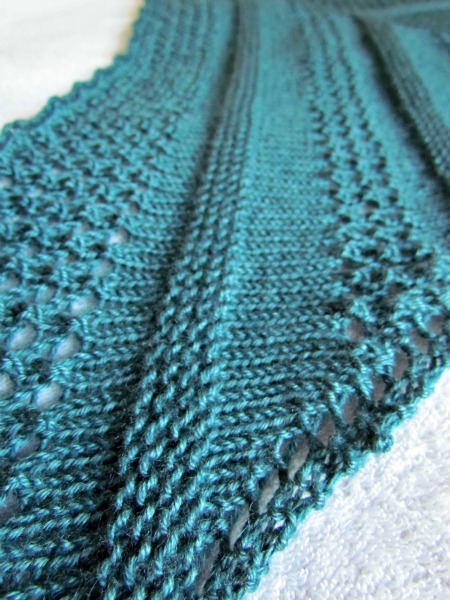 I'm off to knit (of course) and will hopefully finish my shawl before going back to school on Monday! 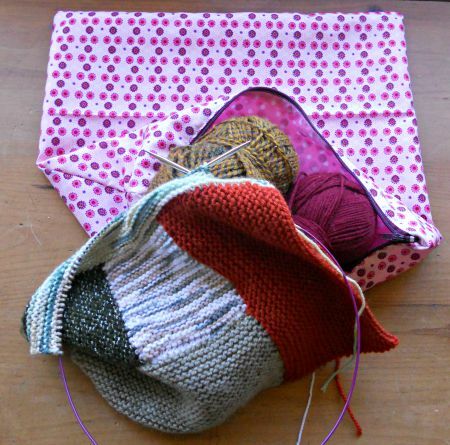 Well, here we are half way through the year and it just so happens that I'm half way through 3 WIPs! Do you want to see? 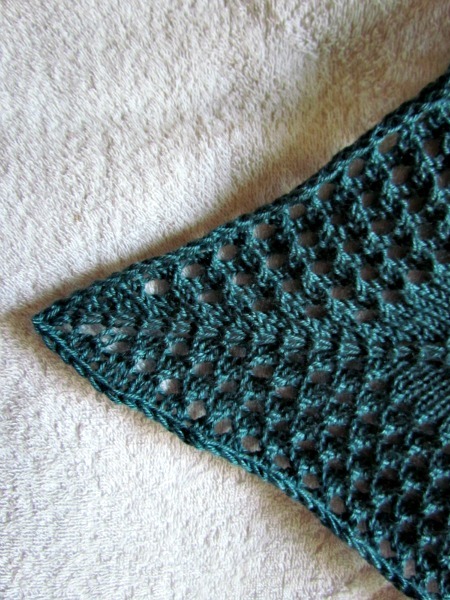 No 2 WIP is a shawl I'm knitting for myself. As you can see, I'm not really halfway through it but it grows pretty fast so I'm sure halfway isn't too far in the distance. 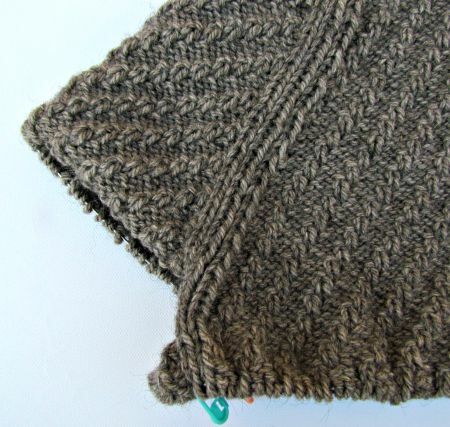 My final WIP is a sweater for me in a gorgeous grey/brown aran yarn. 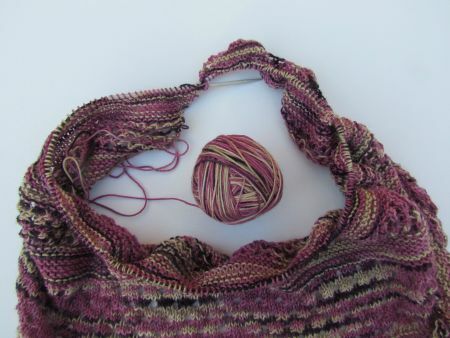 I started this a few weeks ago but the cable adventure above and my shawl have taken over somewhat so Smithfield keeps getting shoved to the bottom of the workbasket. 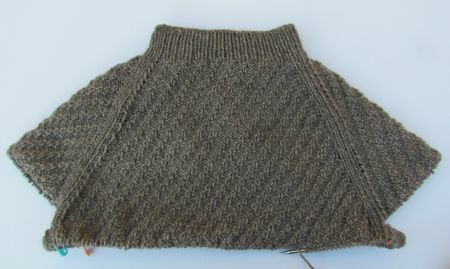 It's a top down pattern and this is the collar - looks a little skinny too but the yarn is quite stretchy and I've pulled it over my head more than once just to check! 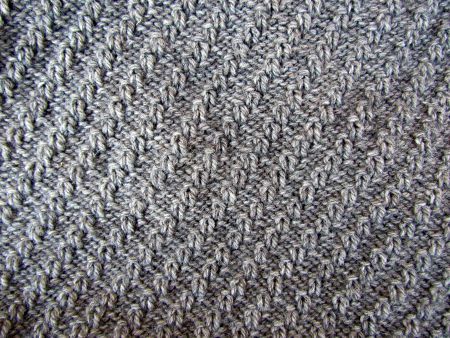 In the pic the yarn looks more grey than brown but it's both all flecked together. So that's my WIPs for now. I really hope to have some finished things to show you in my next post so pop back when you can!